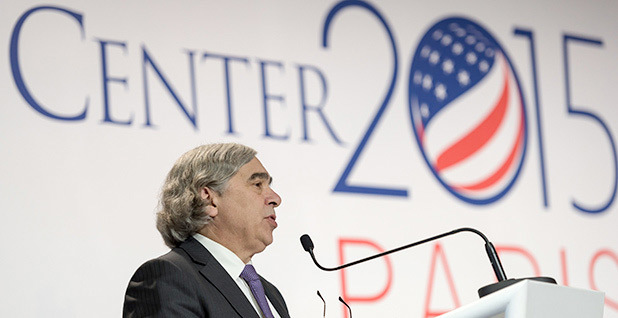 Energy Secretary Ernest Moniz will headline a Clean Energy Ministerial event next week aimed at making the Paris Agreement's clean energy goals a reality. Photo courtesy of AP Images. The Department of Energy is usually a supporting player in international efforts to contain warming, but it steps into the spotlight later this month to host the Clean Energy Ministerial (CEM) in California. The 24-country event in the San Francisco Bay Area marks the first time energy ministers will come together to swap clean power and efficiency ideas since last year's landmark Paris climate deal. Energy Secretary Ernest Moniz said yesterday that the ministerial and other planned events would complement Paris by helping countries "double down" on their emissions reduction commitments. "We committed to elevating the innovation agenda as part of the road to Paris, because while Paris was a critical first step in heading to the clean energy future, we all understand that the commitments made in Paris were for a 10- to 15-year horizon," Moniz said at a breakfast hosted by Politico. Keeping new commitments coming at five-year intervals as envisioned in the Paris deal depends on "technology innovation that continues to drive down the costs," he said, adding, "Cost reduction is big." So between May 31 and June 3, DOE will host not only the seventh annual CEM but the first meeting of Mission Innovation. That's a commitment to double research and development funding for advanced low-carbon energy technologies by 20 countries, 19 of which are also members of the ministerial. Add to that field visits to Silicon Valley-based companies like Tesla and Google, meetings with financiers and a separate gathering of non-state actors hosted by Gov. Jerry Brown (D), and the spring events aim to start answering questions about tools countries might reach for to help meet their Paris goals. "We're really trying to have this year's CEM be a pivot point, an inflection point to a much more ambitious version of what we can offer each other as a group of the major countries of the world," said David Turk, DOE's deputy assistant secretary for international climate and technology. The Clean Energy Ministerial comes on the heels of a U.N. climate negotiating session where diplomats are starting to fill in some of the rulemaking gaps of the Paris Agreement. But investors said that while the U.N. climate body provided context for a transition to lower-carbon technologies, venues like the CEM could deliver more practical results. "You never get U.N. diplomats talking about air conditioners," said Hal Harvey, CEO of Energy Innovation. "But that's where the action is, right? At the end of the day, it's power plants and buildings and industry and factories." The Clean Energy Ministerial, which was initiated under former Energy Secretary Steven Chu, has a lower profile than the State Department's role in U.N. climate negotiations or some of U.S. EPA's flagship regulations -- like the Clean Power Plan. But participants say it has the potential to make a major difference as the world moves to implement the Paris Agreement. The group of 23 countries and the European Commission is small, but its members are collectively responsible for 75 percent of the world's greenhouse gas emissions and 90 percent of its clean energy investment. They include developing world giants like China, India and Indonesia, as well as developed countries like Canada and Japan. The initiative's aim is to share best practices and policy ideas to help countries that wish to do so reduce energy use or boost alternatives -- with hopes of reaping both climate and economic rewards. The ministerial has a small secretariat that has been housed at DOE throughout the Obama administration, but the United States has proposed moving it to the Paris-based International Energy Agency after this year. A move would require member approval. DOE officials say it would give the body multilateral ownership. It would also insulate it from the effects of this November's presidential elections. Jonathan Elkind, the Energy Department's assistant secretary for the Office of International Affairs. Photo courtesy of DOE. The secretariat is also readying three new initiatives to roll out in San Francisco next month. DOE officials told ClimateWire that this year's offerings would deal with air conditioning and cooling efficiency, industrial efficiency and corporate sourcing of renewable energy. The topics were chosen, agency personnel said, because of their potential to help especially developing country participants embed efficiency into new infrastructure investments they make domestically and the products they manufacture for export. Examples of "leapfrogging" abound in the CEM's relatively short history, they say. Harvey called the focus this year on air conditioning "staggeringly powerful" because it could limit use of hydrofluorocarbon "super pollutants" as well as carbon emissions. Turk and Jonathan Elkind, DOE's assistant secretary for the Office of International Affairs, each pointed to India, which introduced the world's first comprehensive standards for LED lighting systems last year using input from CEM's Global Lighting Challenge. India's minister of state for renewable energy, Piyush Goyal, then deployed LED lamps to rural Indian villages that lacked access to power. The new demand caused prices to drop. "So they rapidly took a step that otherwise would have taken them years longer to do," Elkind said. Elkind said he hopes that success can be duplicated this year. China manufactures 70 percent of the world's air conditioning units, and its adoption of efficiency standards could reverberate throughout the supply chain. 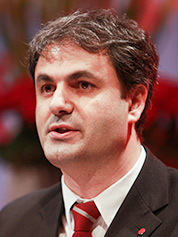 Elkind has been involved with the CEM since its inception despite having been in his current post for less than a year. He told ClimateWire that it complements the goals of the U.N. climate negotiations in part because the two processes are so different. Where the U.N. Framework Convention on Climate Change is run by diplomats and lawyers, the CEM involves energy experts and officials. Where the latter depends on an often hard-won consensus, the CEM intentionally shuns joint communiqués and decisions. "We made a conscious choice that countries participating in the CEM were to feel free to participate in individual initiatives as they saw fit," said Elkind. "That has served us very, very well, because it has grown up as a context for trust and peer-to-peer collaborations." Those collaborations will give countries a valuable resource to draw on as they implement their so-called nationally determined contributions (NDCs) to Paris, he said. While the CEM has a limited membership, countries outside it can take advantage of programs like the Clean Energy Solutions Center, which the body rolled out in 2011 to field government inquiries when drafting laws, initiating public-private partnerships and otherwise creating an environment in which clean energy can flourish. The United States' National Renewable Energy Laboratory plays a coordinating role. DOE says this year's gathering will scale up the center's resources to help countries implement their NDCs. Karen Hughes, international program manager for the Alliance to Save Energy, which will participate in the ministerial, noted that helping countries better define their commitments and turn them into action is one of the Obama administration's main post-Paris goals. And it's important to the success of the agreement, she said. "The NDCs themselves are scattered, they show very little uniformity, and it isn't clear that there is an implementable or straightforward plan in every country," she said. While the United States will host the event this year, that isn't always the case. Next year's venue will be China. Moniz said San Francisco was chosen as the site of this year's event because it is "one of our hotbeds of innovation," not only in the public but in the private sphere. Besides the field trips -- Moniz said he looks forward to touring Tesla Motors with Elon Musk and test-driving one of his cars -- organizers will also fill Union Square with demonstrations of clean energy technologies from the region. Ibrahim Baylan, Sweden's energy minister, will be among dozens of foreign officials at the Clean Energy Ministerial event. Photo courtesy of Wikipedia. Ibrahim Baylan, who will represent Sweden at the event, said he is excited that this year's ministerial will take place in Silicon Valley. "It is hard to think about any better places to meet after Paris and to look into the future," he said. "It's the perfect location to gather decisionmakers from government and business to discuss how we, with joint forces, can accelerate the clean energy transition." The CEM "saves a lot of time," he said, because countries can learn from each other's experiences. 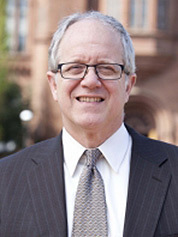 "The Swedish electricity and heating sector are more or less decarbonized," he told ClimateWire. The country draws most of its power from hydropower but is making gains in other renewables and has held demand flat for decades. Matar Hamed Al Neyadi, an undersecretary for energy from the United Arab Emirates, called clean energy and efficiency "key to the future of the sustainability of the energy sector" in his country. "One of the areas that the UAE has championed is the successful development of public and private partnerships in the area of renewable energy," he told ClimateWire. "This is a model that we are sharing with international stakeholders from around the world using the CEM platform."